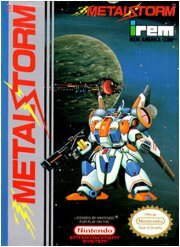 Review: Hey, remember Metal Storm? What’s that? You’ve never heard of it, and you’re sure it must have been a crappy game because of that? Well you’re wrong. No marketing and a generic name do not a bad game make. The plot is... ah, who cares. The plot is that you control a big robot and you’re fighting through waves of robots and such in order to, let’s say, save the world. It’s the NES. The ratio of games with stories to games without stories was somewhere in the neighborhood of 1:50. That your robot has guns should go without saying. The thing that sets your robot apart from others in the giant robot genre is that yours can reverse gravity at will. If you come to a gap that’s too wide to jump, you can simply flip the gravity and walk along the ceiling. Being able to fly would’ve been handy (instead of up or down, you could switch the gravity to “neutral”), but the controls are simple enough that you’ll have a pretty good handle on it after only a few minutes of play. And god help you if you don’t. The first stage of the game has you running down a single hallway blasting away at mostly defenseless robots to build up your confidence. By the second stage, however, you’ll need to have a good handle on both gravity flipping, and just plain jumping. The bad news about your hi-tech robot body armor... thing, is that even the slightest touch of anything that isn’t either a powerup, or the ground itself, means death by spontaneous combustion. Action is definitely the main focus, but negotiating each of the game’s 7 stages also requires a small amount of puzzle-solving. In the above mentioned second stage, for instance, you must travel from the left side of the screen to the right side of the screen, but the catch is that the levels wraps from top to bottom. You can use this to get around some of the trickier robots, but a careless gravity flip could land you right in a bed of spikes you didn’t even see because they used to be below you. Later, you’ll encounter levels that wrap from top to bottom AND are constantly scrolling upwards like some kind of insidious horizontal barber pole, and in later scenarios, you’ll be trapped inside a box, dodging enemies and hazards alike as they scroll past you. It all requires quick thinking, good reflexes, and a certain amount of memorization to make it through. In other words, it’s a true old school game. Newer gamers may find themselves irritated by some of the games trickier sequences (not the least of which being a boss that uses a pair of satellites), but it’s just a matter of practice makes perfect. You start off with three lives, and though extra lives are in short supply, the game allows an infinite number of continues. I recommend bringing a friend so that you can alternate. You’d be surprised just how angry you can get, dying in the same spot over and over again. this is one of my favorite nes games, as far as pattern recognition it's not really that difficult a game. i play through it maybe twice a year or so to hear the music again. I want to thank you guys so much for this. It's nice to see this game get more recognition, and it's just a shame that it didn't get the recognition it deserved. You DO know, however, that after beating the game you can get a special password that allows you to play the game again on an INSANE DIFFICULTY? unfortunately the 'game for experts' is just stupidly impossible. you get to lvl2 and those electric barricades or whatever that move in to crush you react twice as fast, so you have to get the armor and take a hit goin up the first five, then pull off this perfect maneuver jumping the right height to set it off, then when its pulling back jump down and jump again doing a gravityflip the instant youre high enough to clear the platform. Old school NES games for life! At first I thought I had played this but it appears I have mistaken it for a similar SNES mecha robot game that also has Metal in the title. That had a killer 2 player Vs mode. From a self proclaimed old school NES geek: Great game.